This chapter describes how to access CiviEngage functionality and gives suggestions on how to use the custom field sets and profiles that it includes. update the Permissions for the Adminstrator role to access CivCRM_engage module by checking the box for access civiengage settings. Note that CiviEngage requires the component CiviCampaign to be enabled. Media Contact: will expose the custom field set, Media Info, containing information specific to media contacts, such as their media type (e.g. Newspaper, Radio, TV, etc. ), their "beat" (area of operation) and media issue interests. Elected Official: will expose the custom field set, Elected Official Info, containing information specific to elected officials, such as their elected level (such as City Council or Senate) and the role (such as scheduler or spokesperson). Funder Contact: will expose the custom field set, Funder Info, containing information specific to funders, such as their programme areas and issue interests. Media Outlet: will expose the custom field set, Media Outlet Info, containing information about an outlet's type of media, such as TV, Radio, Wire, Newspaper, Magazine, etc. Foundation: will expose the custom field set, Grant Info, containing fields where you track information specific to grants, such as the average grant amount a foundation will give and funding areas the foundation is interested in. When you install CiviEngage, a number of custom fields are automatically created. These fields are designed to support your community organising work. Most of these fields are multiple choice fields which have been pre-populated with sample options. Before you start using CiviEngage, you need to review and modify the supplied options to meet your needs. Note that CiviEngage has been developed with the North American context; if your organisation operates outside the USA you may need to customise the language but most of the concepts will be similar and useful to your organisation. We strongly suggest that you do not delete any custom fields or custom field sets, since other features such as reports and searches may rely on these fields; deleting fields could potentially break these and other CiviEngage features. To review the custom field sets, go to Administer > Customize > Custom Data in the navigation menu. The following list describes each of the custom field sets provided by CiviEngage; the bulleted items are custom fields within those custom field sets. You should add, edit, or disable (we highly suggest that you do not delete) the available options for each custom field to make them better fit your organisation's needs. See Creating Custom Fields for more information about custom fields sets. This custom field set can be used to provide more details about when to best contact your constituents, if they have good addresses, email addresses, or phone numbers, and the reason why they don't want to be contacted by email, or phone, or mail. Best Time to Contact: indicate if the best time to contact your constituent is in the morning, afternoon, or evening. This custom field set may be used to capture voter demographics about your constituents. You may also want to add specific local voter fields that apply to you. Voter History: A (Always votes), O (Occasionally votes), N (New Voter); you can add other values to describe how your constituents votes. 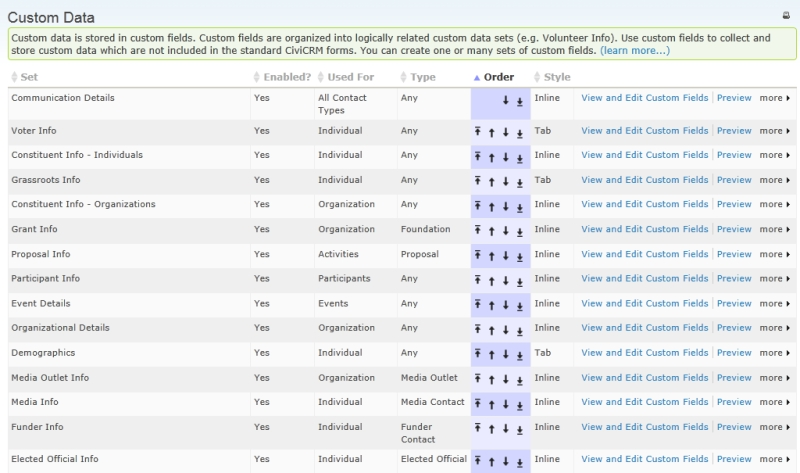 This custom field set may be used to describe additional information your individual contacts, such as how you want to classify your contacts for ease of searching and targeting form communications, which staff person is responsible for outreach to the individual, and how and when the individual was brought into your organisation. Constituent Type: This is a required field used to categorize the type of contact, such as Volunteer, Activist, Board Member, Donor, Ally, etc. Staff Responsible: note that the values for this field are also used for Event Contact Person. Replace the sample names in the list with your staff, member or volunteer coordinators, and other folks that have individuals assigned to them. Date Started: may be used to indicate the date your constituent was brought in to your organisation. How Started: edit this list to fit the ways in which members are brought into your organisation. This custom field set may be used the to further capture information about how a constituent likes to engage with your organisation, the types of issues and volunteer activities they're interests, their level of leadership, and their status as a member. These fields provide another way to categorise your constituents to better target your audience for outreach and communications. Member Status: three status choices of Active, Inactive and Deceased are included by default. Think about other member statuses that might work for your organization and add or remove as needed. Leadership Level: the default options for tracking an individual's leadership level within your organisation are 1-5. Change this to match however your organisation tracks this information. Issue Interest: this may be used to capture what issues your contacts are interest in. This custom field shares the same set of options as the Funding Areas (for organisations), Media Issue Interest and Funder Issue Interest fields. It is a list of issues that your organisation works on or tracks. Volunteer Interests: a list of volunteer activities that your members can take on. This custom field set may be used to classify the type of organisational contact so that you can target your outreach and communications. Constituent Type - Org: this custom field is required and may be used to classify the type of organisation contact, such as Member Organisation, Affiliate Organisation, Business, Government. This custom field set may be used to capture information about grants for a particular foundation. You can view and edit this custom field if you create an organisation contact with subtype Foundation. Funding Areas: this custom field uses the same set of options for Issue Interest and Funder Issue Interest. This custom field set may be used to capture information about grant proposals. You can add, view and edit information about proposals when you create an activity of type Proposal for either a funder contact (an individual contact with type Funder Contact) or for a foundation contact (an organisation contact with type Foundation). This custom field set, which is available when you create a participants for your events, may be used to capture information about participants to your events, such as if they need childcare or rides to and from the event. Organisers who contact potential participants multiple times before an event can also capture responses from participants to track over time if they were able to get their constituents to participate and how many contacts it takes to encourage them to come to the event. This custom field set is used to capture additional information about your event. Event Contact Person: also used for Staff Responsible. Add all appropriate people to this list. This custom field set may be used to store information that is specific to organisations. Rating: if you need to evaluate organisations in some way, change the options to reflect that. This custom field set may be used to capture demographic information about your constituents. This custom set is only applicable to the organization contacts with subtype Media Outlet. Media Type - Org: this custom field uses the same set of options as Media Type - Ind field - TV, Radio, Wire, Newspaper, Magazine, etc. This custom field set is only applicable to the individual contacts with subtype Media Contact. Beat: this refers to the general category of topics that a media contact covers, such as local government, education, neighborhoods, religion, labor, etc. Media Issue Interest: uses the same option list as Issue Interest. As you come to know a reporter, you will learn the issues they are particularly interested in, even if it differs from their assigned beat. This custom field set is only applicable to individual contacts with subtype Funder Contact and may be used to capture information specific to the funder contact. Funder Issue Interest: this custom field uses the same set of options as Issue Interest and Funding Areas. This custom field set is only applicable to individual contacts with subtype Elected Official. Elected Staffer Role: whether the contact is the elected official, or the official's staff, spokesperson, etc. CiviEngage includes many custom fields with value options. The following are examples of value options that you may want to consider reviewing and modifying to match the kinds of information you need to track for your work. To learn more about working with value options or multiple choice options, see the chapter called Creating Custom Fields. It is important to remember that despite appearing with different labels in these different contexts, you are still dealing with just one shared list of options. In planning to use CiviEngage you should come up with a list of distinct issues that are important to your organisation and that you will want to utilise when tracking individuals' interest in your organisation's work, the issues that your media contacts may be interested in covering, a funders' general interests and the specific areas of work included in particular grants. The value options for Volunteer Interests contain activities that your organisation's volunteers can take on and participate in; you can indicate each individual's interest in participating in these ways. They are included in CiviEngage as an option list. In planning to use CiviEngage you should establish a list of your organisation's current volunteer activities as well as any activities that you are planning to launch in the future. Some examples of volunteer interests are canvassing, phone banking and tabling. We strongly suggest that you create labels with names that are descriptive, and for the values use abbreviated names so that when printing out WalkLists or PhoneBank reports using the Survey Report, the code or value is displayed to keep your report neat and easy to look at for recording responses. CiviEngage creates several custom Profiles for easier batch updating of individual or organisation information, such as voter demographics, issue interests, volunteer interests or event participant information. CiviEngage in combination with CiviCampaign allows you to easily set up your surveys for walklists during door-knocking canvasses and for phonebanking. You will want to think about the questions and responses you want to collect from your target audience in a manner that will be useful in analysing results from your efforts after you've conducted your canvass or phonebank. create your custom data set of questions and responses you plan to use for your survey if you plan to ask more than 1 question that extends Activities of type Walklist or Phonebank. create the custom profile that includes the questions you will want to ask your audience. Hint:If you plan on doing a phonebank and want to do the data entry directly into civicrm, then you may want to add the phone number in the profile, and set it to view only, so that you can see the phone numbers when you're interviewing the respondents. The profile will allow you to display (view only or you can edit data) other fields of information when you're ready to interview and enter the data. create the group or smart group of the individual contacts you plan to survey, which is your target audience. Make a decision if this survey is part of a larger campaign, and if so create the Campaign and indicate this campaign when creating the survey (you can find out more about create campaigns in the Campaigns section of this book). use the Survey Default Result Set Options that's created by CiviEngage to help you track the status of the responses to the survey if appropriate. If you plan on conducting many surveys throughout the year (let's say 20 - 30 surveys in a year) with only a few questions per survey (let's say 3-4 questions per survey), then we strongly suggest that you create ONE custom data set that includes all the questions for each of the survey. Then you can create individual custom profiles for each survey that pull in the questions that are particular to that survey. Create your custom data set to hold your questions (to learn more about creating custom data sets and fields, see the Organising Your Data section of this book). Then for both Walklist or Phonebank surveys you can create the questions as the custom field labels and the responses you want to collect as the option values. Next, create the custom profile that will pull in the questions for your survey (to learn more about creating profiles, see the Organising Your Data section of this book).